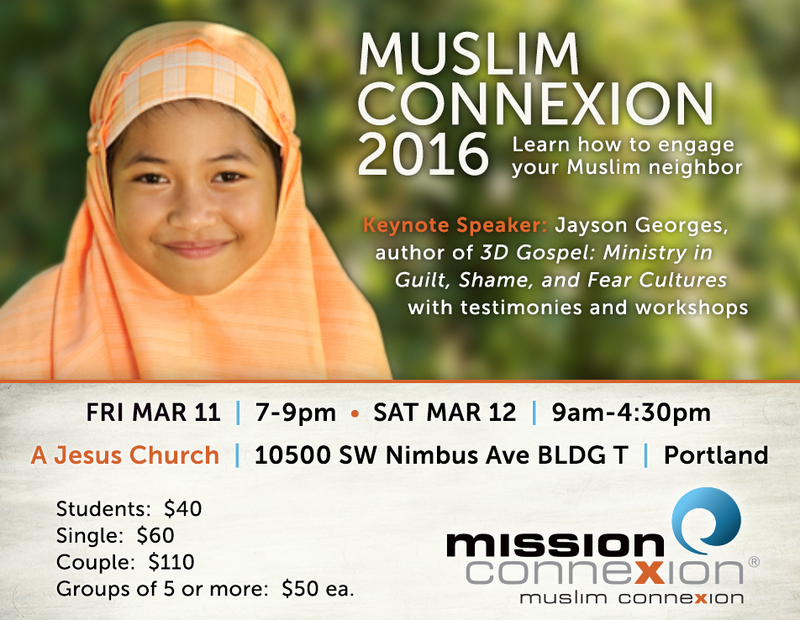 Learn how to engage your Muslim neighbor with the Good News of Jesus. This year’s Muslim Connexion event will be both educational and motivational. Our first ever (and long overdue) Ministry to Muslim Women panel and two workshops focused on that topic will set the pace for our goal of equipping the church to love their Muslim neighbors. Our educational theme continues with some excellent insight and research into the uniqueness of sharing the Gospel within Shame and Honor worldview contexts. The author of the popular book, 3D Gospel will join us as the keynote speaker. Finally, there is no more inspiring section of the event than the testimonies of Muslim-background believers. Come hear how God is miraculously saving Muslims and wonderfully using them to engage the refugee and international student populations around us. We have a lot to learn from them! Don’t miss this event! What a great opportunity to be equipped and motivated to be on the crest of the wave with what God is doing in the Muslim world and the Muslims in YOUR world.